Bruges is famous for it’s water canals, cobbled streets and medieval buildings and often is described a fairy tale city. 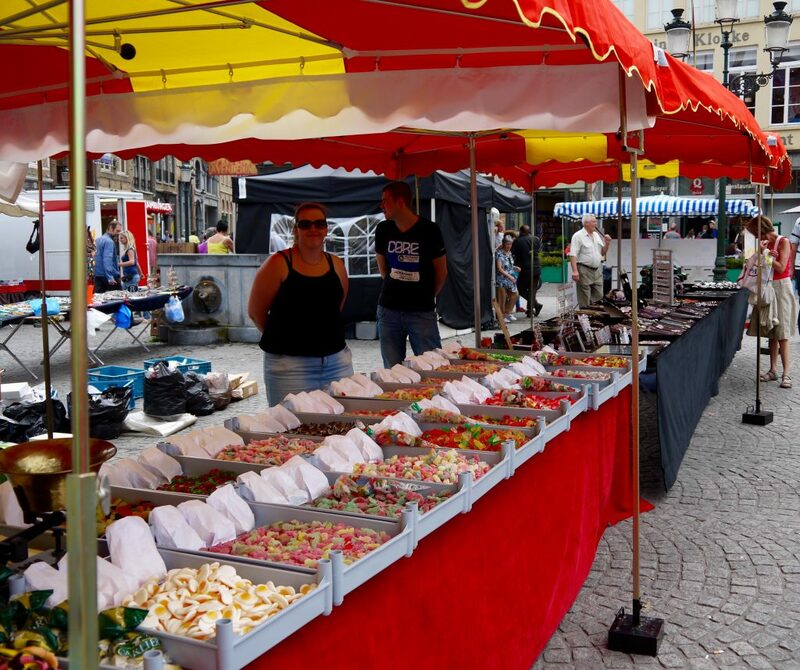 Bruges is a great destination for people who have a sweet tooth and want to try some of the best chocolates in the world, but there’s many other things you can do in Bruges. Check them out! A walk back in time into the medieval times, with breathtaking buildings and streets that still bare within them, the sounds of the past. 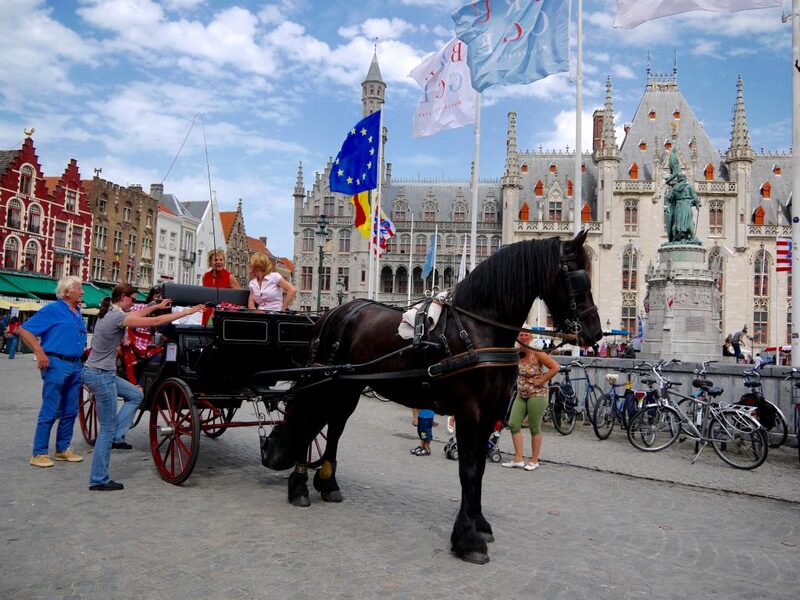 Visiting the old city centre is the first thing to do when you go to Bruges. Markt, as the Belgians call it is a large open square with horse-drawn carriages and neat restaurants where you can have a taste of the city as well. Close to the Bruges Central Station, the Minnewater Lake is offers a pleasant and relaxing stroll for those who want to take a rest and enjoy nature. With its small lake and the beautiful buildings on the water’s edge, the Minnewater park is a great choice if you just want to slow down a bit and have a peaceful moment, while enjoying the breathtaking natural scenery. This idyllic old place with a village-like feel and beautiful gardens is in close vicinity to Minnewater Lake and the old city center as well, so it’s worth walking to. Beguinage is especially beautiful when the daffodils are in spring so you gotta visit it when in Bruges. 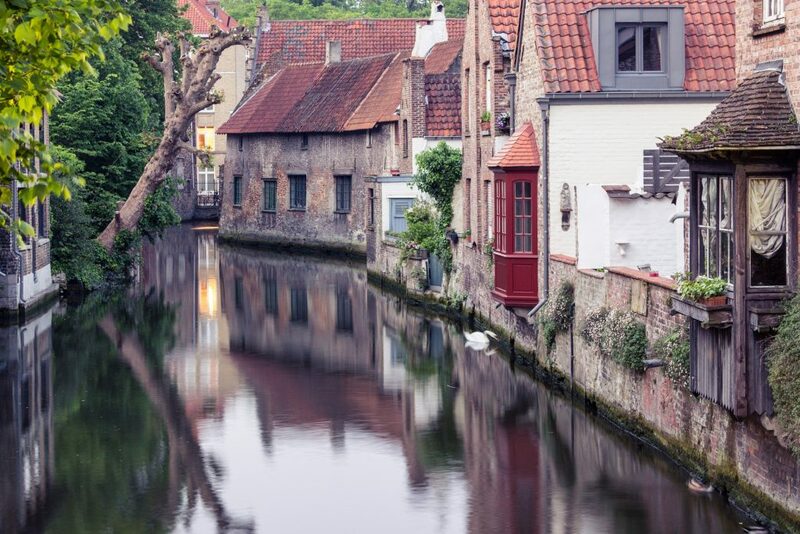 Another way to experience Bruges is by talking a cruise on the city canals. You can take a boat trip from one of the 5 boarding points where a boat takes off every few minutes, from 10 am to 6 pm and enjoy the breathtaking Venice of Belgium. If there’s a place in the world where they have great chocolate that’s gotta be Belgium! And if you’re a chocolate fan like me, you cannot miss out a visit Bruges’ Old Chocolate House for the most amazing cup of hot chocolate you’ll ever have and a traditional waffle to go along. And then of course, The Chocolate Line Bruges for some delicious chocolate pralines. We know Bruges because we were there few month ago, and then we reviewed it on our blog! This city has a special place in our heart, we love it!! WOW it looks absolutely gorgeous there! 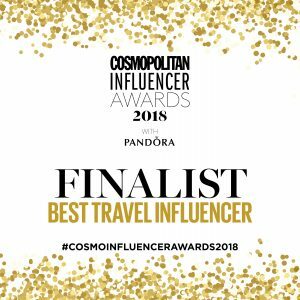 So much culture and history – looks like the kind of place I’d fall in love with! I don’t know whether I liked the pictures of the canals (so beautiful) or the food (so yummy) better! Thanks for sharing these beautiful images! I’m excited to open another exciting collaboration with Los Angeles-based brand TOBI starting this week at the blog – please stop by & lemme know what you think! I LOVE your photos!! This place looks awesome! What a gorgeous place! And that food looks amazing! Those pics are beautiful! Thanks for the linkup! Beautiful pictures! I love just exploring places and seeing what is in the town. Love the windmill and the buildings. THanks for sharing! Great travel tips, saved to my folder for future references!! What city is this awesome place at? I only got to spend a few hours in Bruges but fell in love. Such a charming city! What a gorgeous city; I’d love to be able to visit one day! Looks like a fun trip. What is being sold under the waffle picture? It looks like candy, but I can’t tell. 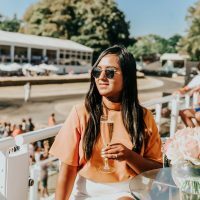 This blog post introduced me to a cool, new place I need to book asap. Thank you for sharing great photos and great content! Keep it up! Oh my goodness, I love all of it! Your pictures are spot on. Look at all those delicious sweets! I want that waffle in my belly RIGHT NOW! Bruges looks amazing – it hardly looks real! First, your photos are absolutely stunning! 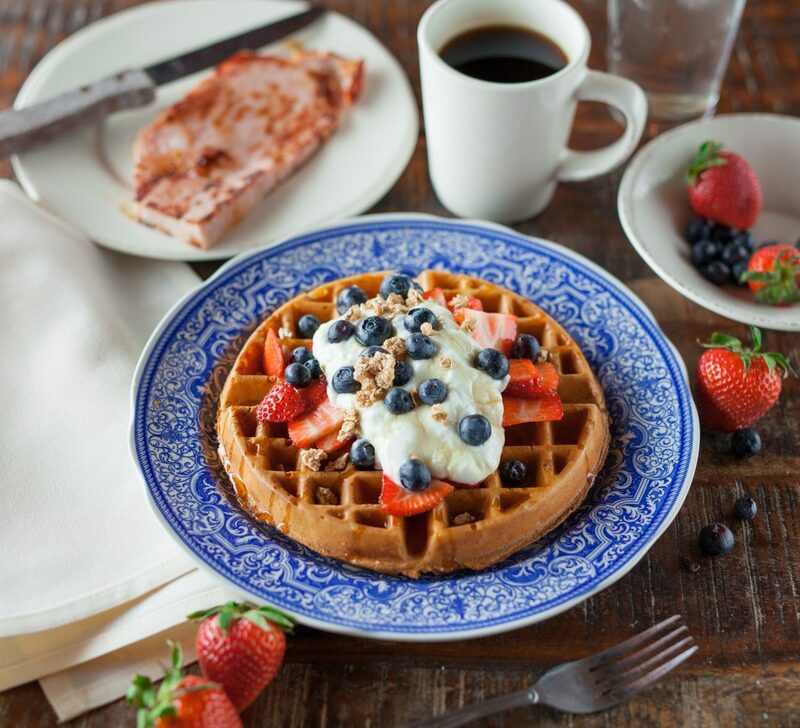 Second, that waffle looks divine! Third, I SO want to do all of these things!! Bruges is on my list! You had me at chocolate 😀 What a cool place! What a beautiful place! I visited Brussels but can’t wait to see Bruges one day too! All your photos are beautiful. I havent had waffles or a pancake in forever… I’m due to enjoy some. Lol. Ooh, cruising the canals sounds like a really special experience! I’ve never come close to this corner of the world! Looks like such a lovely place. The food alone would make me happy!! your blog post about bruges looks amazing. I guess I have to put it on my list now 🙂 I am also super glad that I now know about your link up. I’ll be sure to participate soon. This is definitely on my bucket list. Thank you for the pictures and the review. 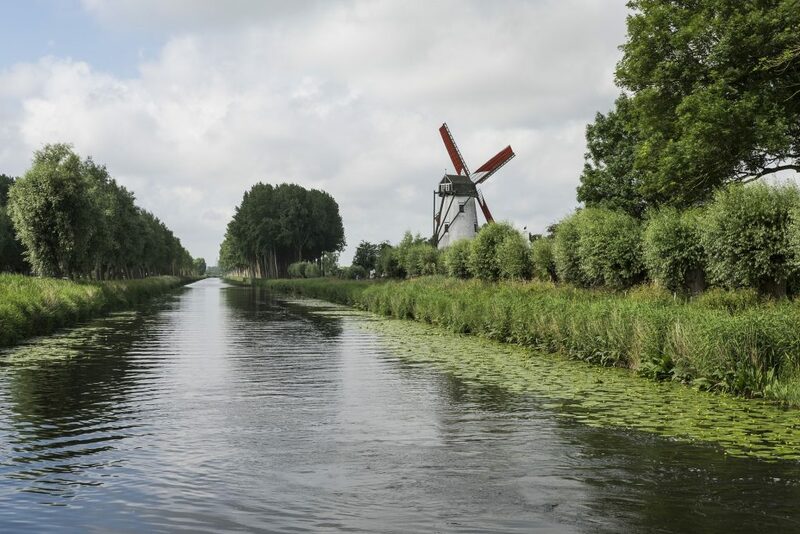 The canals and windmills are amazing. I love the architecture too. Ah I visited Bruges about 5 years ago and this post literally made my heart ache – I love it there!!! Thanks for your suggestions, I hope to make it back soon. It is such a beautiful city. Bruges is one of my favorite European cities. Two years ago we visited it with 2 of our 5 kids. They really enjoyed it. It is simply beautiful. I told my husband I want to buy a house there… dream big! This place is just perfect for me! The cobbles, the water canals and the medieval buildings AND THE CHOCOLATE! Absolutely beautiful pictures! Also that waffle looks sooooo good. Stunning shots.. I would love to visit Bruges!! Those photos are SO beautiful !!!! Bruges is so beautiful. My husband and I were just there a few weeks ago for Belgium Independence Day. There was a party in the town square which was just wonderful. And such a beautiful backdrop! Enjoy! What a cute town! I’d love to visit. 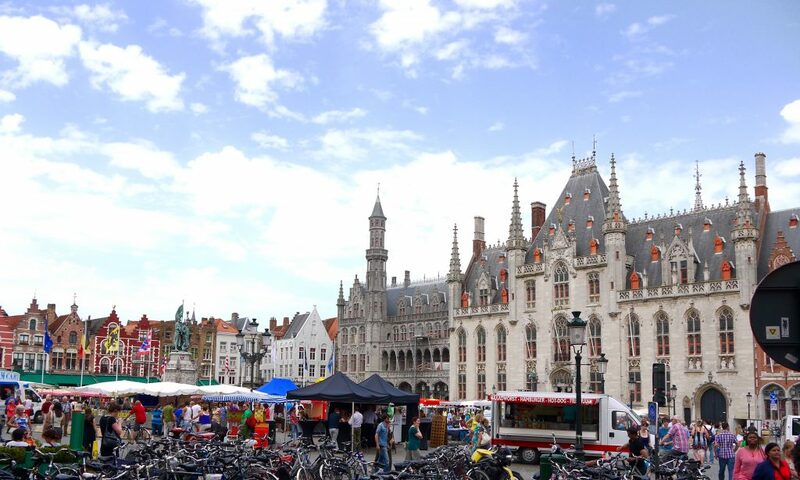 How beautiful your trip through Bruge looks. Wow, I’m not very familiar with that city and it is so historic and lovely! Love your blog and also the blog link up thing. I got introduced to some amazing blogs out there. Such a great initiative. This is on my list of cities to visit while we are living in Europe! Your pictures are gorgeous, and now I am more than ready to go traveling to Bruges! Fellow chocolate lover here as well!